I decided to pop outside in the early morning a shoot a few pictures. I thought this tulip looked rather artistic in it's closed form. As soon as it warms up a bit more it will open. The daffodils have been blooming and I've started fussing more with my fairy garden. I decided to use some brick pavers leftover from something we did a long time ago as a foundation for the cement cottage. I'm just beginning to fuss with it and haven't finished but I'm pleased that I chose this spot because I can see it more readily and even from my kitchen window! I only have a few tulips this year. Between the rabbits that got them last year and some vole activity I had in the years before I guess they've dwindled. I just love the Jack Frost Brunnera. It's reliable and the little flowers are the sweetest. So far only the one is booming but I expect that will change soon. The Hosta are all on their way up and the Coral Bells are coming alive. The flower always makes me think of Forget-Me-Nots. I picked up some new planters from our Sam's Club. They look like expensive iron planters but their not! I've got some Fuchsia and Alyssum planted in them. I chose this Gartenmeister Fuchsia for it's height and of course the hummingbirds love it. This is the other one I got. It's low and wide so I planted it with a very traditional combination. I hope I like it as it grows. I put a lot of Dusty Miller around the edge and I know they can get kind of big so I may have to trim them if they overwhelm the Geraniums. I saw a hummingbird race to it but I don't know if there is anything they can get from a Geranium. Last fall I picked these sphere planters up out in Pennsylvania. I've got a moss basket for it and some flowers which I hope to plant today. These are the flowers for the spheres. More Fuchsia and some Bacopa to fill and spill. The morning sun highlights things so nicely. As you can see the Sweet Woodruff is well spread around the side of my host hill. The trees are still leafing out but not full yet. These are the impatiens I chose for this year. The tag calls them "violet". I think their hot pink coloring will show off nicely. The Creeping Jenny or Moneywort fills in everywhere. I may snag some and put some in with those sphere planters. I think if I drop some cuttings in water for a few days they'll root (I hope) There are some Painted Japanese Ferns in here too but you can hardly see them. My original fairy garden weathered the winter pretty well. I haven't done anything with it yet. I've got to get after some maple seedlings that have started to grow in there. Our yard is riddled with tons of them this year. These don't look like much yet but in a few weeks they should start to fill out. I've got some Caladiums, Begonia, Euphorbia Diamond Frost and violas in them. These sit out near the water fountain. My moss basket liners are tired. I'll retire them after this season. I planted geraniums here and a couple of Sweet Potato Vine. This is new for me. I did a bedding planting in the area where the boxwoods were removed. I've got some deep purple/blue supertunias, white geraniums and African daisies planted. Can't wait to see this fill out. Back at the house I re-used a planter from last year and potted it up with Lobelia, Pink Bacopa, Ivy, Pansies, and Impatiens. It should be colorful and showy in a few more weeks. The hummingbird already found the Fuchsia! A hot pink Geranium surrounded by these adorable striped Superbells- should be cute as it gets going! I planted Bubble Gum Supertunias in the garage planters. Can't wait to see them fill out! the pelleted fertilizer is a reliable way to feed. I also use some new Garden Soil each year that comes with a bit of fertilizer it it too. Not too exciting yet, but again once these fill out they'll be colorful. Lastly I chose these soft orange Begonias to be in my window planter by the kitchen. There is some Browallia that will come up behind and Sweet Potato Vine that will drape across the front. We've been having some great weather and the night time temps haven't fell below 45 lately so I took my chances and planted the annuals. We often get a surprise late frost in June so I may have to run out and cover things up but I've done it many times before. I'm still fighting the lasting affects of that darn cold I caught. I'm beginning to think it's also dragging on because of some allergy related issues. I checked our area forecast for pollen and it's pretty high right now. I've gotten more done than I expected, but it's been so much harder this year. I even put my back out for a few days last weekend so I've really felt constrained. 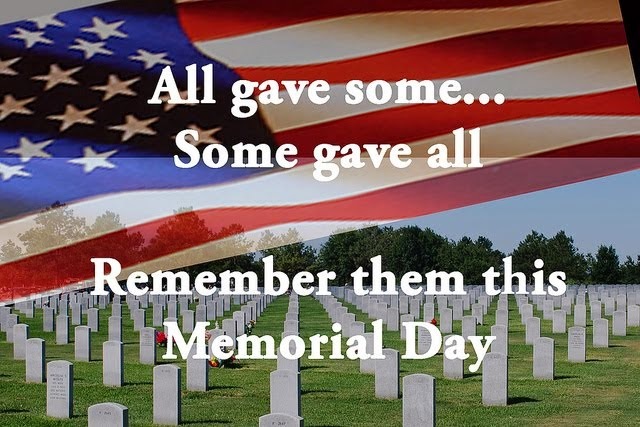 Memorial Day and always remember why we celebrate it. Oh, Liz, I have been waiting on this post! Your flowers are beautiful; and I know that they will get more spectacular as the season progresses! I would love to see it all in person. I know that it is gorgeous! This is what I did today as well. I still have the window boxes to do, with Potato Vine and Tuberous Begonias. Everything looks lovely in your containers! You really are even further behind than I am here which is pretty far behind. Even so I love your Jack Frost and your new fairy garden looks lovely. Liz, Wow! You have been busy! LOVE your urns, especially the low and wide one and your choice of plants. Cute fairy cottage. I'm still thinking of doing a fairy garden, but haven't decided on a place for it yet.You mentioned hummingbirds...we saw one at the lantana on Friday. It's so strange, because we get very few and then not until around the 4th of July. I put out the feeder, but we haven't seen another. I'm glad your cold is finally getting better and your allergies, too. Your garden is so lovely. I love all of your plants and planters. I've been busy planting too. I love this time of year. I love your stone walkway and all of your gorgeous pots of annuals. I see you bought impatiens too. I really haven't had the mildew problem with them like many othrers did. start to look ragged after filling out. Are your supertunias like the wave petunias? You have been busy and it shows. Your garden looks lovely. The paved path is my favorite, along with the beautiful flowers. Great planters you bought from Sam's Club. It feels s good to finally sit back and enjoy the fruits of your labor. Happy Memorial day. You just can't beat annuals for the show. All your planter combos are going to be gorgeous. I planted a couple of those Gardenmeister Fuchsias for the first time this year. I'm anxious to see how they do. Oh my goodness, you have been busy Liz!! I so love you stone pavers, I've always wanted them for a walk way someday. Hi Liz, your garden is gorgeous. You have been so busy and it looks amazing. I love your beautiful blooms and all the special details you add throughout. This should be in a magazine my friend. Love it and so inspired. Liz, What a treat to visit your garden! It is absolutely beautiful! Beautiful blog too! Glad I found this. Can't wait to see everything in full bloom!! STILL fighting that cold??!??! Good grief! It REALLY got you! I'm so sorry!!! I try so hard to do container gardening, but I'm just not all that great at it. I don't understand how you're able to cram so many plants into a single container. It just baffles me. I guess it's the OCD in me that wants everything evenly spaced, etc. I don't know. I did some yesterday and forced myself to put in more than what I usually would so I could get a fuller look. Here's hoping! Looking at yours (especially the traditional one with the Dusty Miller, geraniums and red spikes), I now feel the need to put more in my front porch containers. I just can't figure out how to squeeze them all in??? I also did an herb container this year with basil, tarragon, parsley and oregano. I put rosemary in a container by itself since I'll have to bring it in over the winter. I just hope it survives! I'm also trying my hand at a single habanero plant. Oh...and some spearmint! We'll see what happens. You have such a wonderful hand at gardening. It's really quite enviable! You know how to do it all out there!!! I think part of it is because you enjoy it so much. That's half the battle. Looking great as usual!!! Have fun putting those impatiens in. They're going to be really pretty!!! Liz, Your gardens are designed beautifully! I love the stone paths and you have some great containers started. I like the fairy gardens too! Will be following along, watching your garden grow. Liz, I love your containers...I haven't planted a one but may do a few once I am up to it this week or next...love the impatiens you picked. I loved seeing this! What a beautiful garden area. A lot of work, I know! We can't plant impatiens. There is a mildew blight, so the farms won't grow them. I see HD is selling them, but they will probably die in a month. I love the Diamond Frost, the deer don't eat it, which is a problem here. I didn't get one tulip this year! Can't wait to see your place when it all fills in!